As the swimming events at this year’s Olympic Games come to an end tonight, the world’s eyes are on swimmer Michael Phelps…including mine. As an orthodontist, I can’t help but look at people’s teeth. You know, like how Tom Cruise’s upper midline nearly lines up with his left nostril, or how Jewel’s upper right canine sticks out. It’s all just interesting for me to look at and evaluate. So, when Michael Phelps wins yet another very deserved gold medal and takes that podium, I stare in amazement at the structure of his mouth and the position of his teeth. I can’t help it! It makes me wonder if his career in swimming has resulted in this facial structure, or if the facial structure has allowed him to be the world class swimmer that he is. function according to the functional matrix theory proposed by Dr. Melvin Moss a half a century ago. I talked about mouth breathing and the effect it has on growth and development of the width of the upper jaw in the last blog. In general, this long-term open position of the lower jaw, allows the sides of the upper jaw to collapse because the tongue, which “lives” connected to the lower jaw, is not sitting against the roof of the mouth developing width. In addition to a loss in the width of the upper jaw, we often find that the upper jaw begins to grow vertically at a faster rate than it would otherwise. Again, this is because of the position of the lower jaw. When the mouth is held open, there is no force from the lower jaw pushing against the upper jaw. This allows unfettered growth of the bone and the teeth towards lower jaw, which is held in an open position. After all, the function of teeth is to chew, and teeth will always attempt to grow towards each other in order to maintain chewing contact. What becomes apparent is a very “gummy” smile. Lastly, mouth breathers tend to have a very long lower facial height. This is evaluated by dividing the face into the facial thirds. 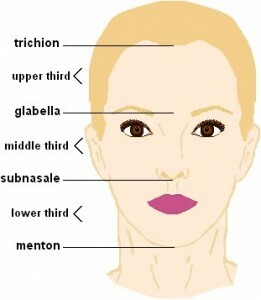 The upper third is defined as the measurement from the hairline (trichion) to the point on the forehead between the eyebrows (glabella) ; the middle third is from glabella to the point where the nose attaches just above the upper lip (subnasale); and the lower third from subnasale to the bottom of the chin. These distances should all be about the same in a “normal” facial pattern. A long lower facial height results from a combination of the mouth remaining open and the upper jaw, especially in the molar area, growing downward. As the teeth make contact with the jaw in this position, the direction of growth of the lower jaw is directed more vertically than horizontally. For example, take a look at Arnold Shwarzenegger’s jaw line compared to Phelps’. More force of the lower jaw against the upper jaw results in a shorter lower facial height and a more horizontal direction of growth. So, back to my wonder and amazement… as an orthodontist, I wonder if Phelps’ is such a great swimmer because his facial pattern allows him to be so efficient at breathing through his mouth, or if his years and years of training and breathing through his mouth have created the facial pattern! Orthodontists can influence this pattern in a growing child- we do it all day long. And so, I wonder if Phelps’ little baby boy will have the same facial pattern, and whether he will be an Olympic swimmer in the future. In the meantime, I’ll continue to cheer Phelps on as he goes for his final gold! Go Team USA! Comments Off on Are Mouthbreathers Better Swimmers? 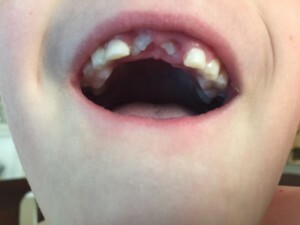 Seven year-old’s teeth coming in crooked? My cousin sent me a text the other day—in a panic. Here’s the picture he sent me . Why? Because if the airway is obstructed, we humans will breathe through our mouths. With the mouth in an open position, the tongue, which is attached to the lower jaw, does not sit where it normally should—against the roof of the mouth. The tongue is a very strong muscle, and its normal day-to- day activities, like swallowing and talking, help promote the development of the upper jaw. Without this normal influence of the tongue, the upper jaw tends to collapse, or become narrow. The adult teeth developing inside the upper jaw start running out of space, and remember, they are bigger than the baby teeth they are about to replace. It’s kind of like shrinking your jeans in the wash…it makes it a little hard to fit into them, especially if you’ve gained a few pounds. So, these developing teeth start twisting and turning to make their way through the space available to them—they’ll come in crooked! Other things that will cause an upper jaw to develop narrow are things like a tongue-thrust ( or juvenile swallowing pattern) and thumb-sucking. The swallowing pattern effects the development of the upper jaw similarly to the mouth-breathing pattern. The question there is, which came first? If the upper jaw becomes narrow due to mouth-breathing, the tongue starts running out of room for its normal function and accommodates itself to where it “lives”—close to the lower teeth. A lisp may begin developing with this as well. Thumb-sucking causes the upper jaw to become narrow because of the upward forces placed upon the developing upper jaw. Right up the middle of the upper jaw is a suture—similar to the soft-spot on a baby’s head. If the thumb is in the mouth long enough and places enough force against the upper jaw, the suture allows changes such that the sides of the upper jaw begin to collapse inward towards the tongue and the roof of the mouth becomes very “deep”. All of these issues are easily addressed if caught early. Often a palatal expander, commonly called a “butterfly” will be used in order to widen the upper jaw. In the case of a tongue-thrust or thumb-sucking habit, a habit-breaker can be used either before or after expansion. The American Association of Orthodontists recommends that every child have an orthodontic exam by age seven to evaluate for these and other potential problems that, if caught early, can make treatment during adolescence easier. If you have concerns about your child, we’d be happy to take a look. Schedule a complimentary exam by calling our office. Comments Off on Seven year-old’s teeth coming in crooked?